A huge project to protect and develop an ancient merchant town in Central China is expected to start in October, a senior local official said. 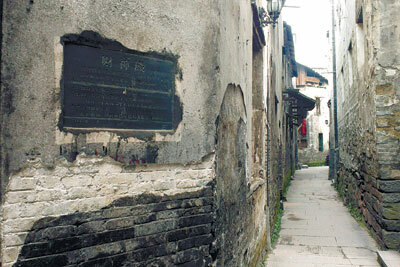 The project involves the Hongjiang ancient commercial town in Huaihua city, Hunan province. Li Hui, mayor of Huaihua, said in an interview on the sidelines of the annual session of the National People's Congress, which ended on Sunday, that preliminary estimated investment of 1 billion to 1.5 billion yuan ($161 million to $241 million) will carefully balance cultural preservation and commercial development. It once served as the assembly and distribution center for various commodities - including oil, logs, opium and white wax - for seven nearby provinces and regions due to its location at the confluence of the Wushui and Yuanshui rivers. Li said many of the historic towns in the region have given way to modernization, but Hongjiang, with its labyrinth of narrow streets and more than 380 ancient buildings, still conjures up an image of ancient China. "Once you're in Hongjiang, you'll find time flows back hundreds of years," she said. The first phase of the project, set to start in October, involves checking buildings in the old town, and the relocation of some residents, Li said. A new residential area outside the old town will be ready before the relocation starts so that every resident who moves out will have better accommodation, Li said. Some illegal riverside structures will also be demolished to restore the original image of the old town, she said. The mayor said the Huaihua government is working with Unitenix, a culture and tourism investment company based in the Hunan capital of Changsha, on the development of Hongjiang, and an overall plan has just been worked out. She said the government decided to cooperate with the company because it gained rich experience in operating a similar project in Fenghuang, another well-preserved ancient town in western Hunan. "More important, they've also learned lessons while handling the Fenghuang project, and know how to balance commercial development with heritage preservation," Li said. As cultural preservation is extremely costly, and many basic facilities need to be built or installed in Hongjiang, Li said the overall investment might reach 1.5 billion yuan in the long run. With Hongjiang ancient town better protected and more developed, Huaihua expects to attract more domestic and overseas tourists in coming years, she said. Huaihua received 17 million tourists last year, up 13 percent year-on-year, and the growth rate is likely to accelerate in following years, according to the city government. Apart from the ancient town, tourists to Huaihua can experience the culture and custom of many ethnic groups, particularly the Dong, with a population of more than 1 million in Huaihua. "China has 56 ethnic groups and you can find 51 of them in Huaihua," Li said. "We have a big family of different peoples." However, Li acknowledged that the travel industry in Huaihua is still in its early stages and many things remain to be done. She said the government plans to train more tourism professionals and tighten supervision of misbehavior to offer tourists a better experience.